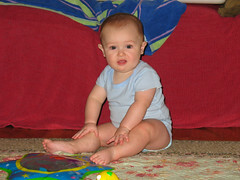 We took this picture twelve days ago when Carter started sitting up. Now, he sits up, crawls, and pulls himself up (he especially likes the size of his step stool for this). He also likes to crawl to his rocking chair (thanks Poppa and Grandma), but once he gets there he gets frustrated because it rocks. He also gets frustrated when he stands up because he can't figure out how to sit back down. There is probably a life lesson in there somewhere. We had to upgrade his car seat to one that is bigger. We had to stop using his bathtub sling, now he sits in the sink . We had to lower his matress in his crib. Cilla worked four days in row this weekend. This was the first time she's worked four days in a row in a longs time. Carter is learning the layout of the hospital since we can't help ourselves. We have to go visit her when she works. We all survived and I got some 'stay-at-home-dad' experience. I got a pair of crocs since I needed some waterproof shoes. I feel like I'm cheating on my Birkenstocks. Will is truly the best father I have ever known. He loves our son with a love that is refreshing and comforting. He is so calm and caring with Carter. I have never seen a father so actively involved with the care and maintenance of a child before. He makes my job as a mommy 100% easier and enjoyable. He makes it all look so easy. I have learned that I wouldn't and couldn't do all of this without him. Carter loves spending time with him and lights up when he walks into the room. Will does such a great job taking care of him on the days I work; it makes me so reassured and happy to know that Carter is well taken care of. I really could not ask for more. My love for Will has grown so much more than I even imagined. I love him as a daddy! So to my love, I can only hope that I make you as happy as you make me and Carter. Happy 7 months, baby boy! They really have been so happy for me and daddy. You are so much fun and are at that age where everything is new and exciting. You continue to make me smile daily as I watch you roll around on the ground discovering how to crawl. Your crib is your own personal wrestling ring! You haven't quite decided how to sit up on your own yet, but I can tell that you are determined to figure it out. You are full of things to say, but daddy and I haven't learned to speak "baby" yet. We would much prefer you to speak our language! You are probably trying to tell us that your are teething with a capital "T"! You have had some grumpy days here lately, but even on a bad day, you are still a great baby. You are usually easily entertained and smile readily at mine or daddy's face. You love your playpen, your high chair, and eating peas and carrots. You are truly the best thing in our lives and I love spending every moment with you and daddy. As I sit here and listen to you talk to yourself trying to soothe yourself to sleep, my heart feels warm and swollen with joy. I love you more than you know and will spend the rest of my life letting you know how much that is. Nine years ago today, I was the happiest woman on the planet. I was about to marry the most wonderful man I had ever met. He was my best friend, a christian, and someone who loved me and my family for who I was on the inside and out. I remember being so excited, but nervous at the same time. I was about to graduate from college, leave my parents, and start a life with this wonderful man who I had only known a few years. With that all on my plate, I began the best journey of my life. I love my husband more today than I did nine years ago. I wouldn't change one day of what has been an amazing, comfortable, and very blessed life. I have a beautiful 7 month old son and a husband who shows me everyday that he loves us beyond imagination. What more could I ask for! Nine years later, I am still the happiest woman on the planet. HAPPY ANNIVERSARY, BABE! My wedding ring has the date '6-6-98' inscribed within. So, today must be my anniversary. My ninth anniversary to be exact. These nine years have gone by so quickly. You're a wonderful wife, babe. I couldn't ask for anything more. You love me and let me be myself. You're a wonderful mother. Carter loves you more than I do. He couldn't ask for anything more. We're blessed to have you in our lives. Thanks for nine great years. I hope we have ninety more.